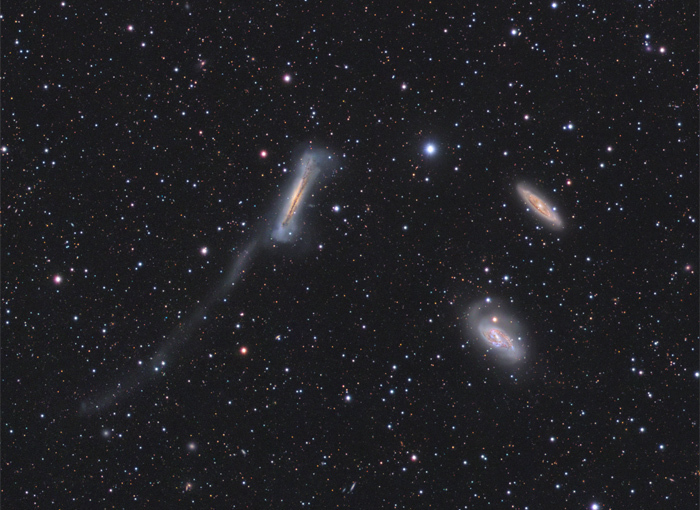 This famous galaxy trio is located about 35 million lightyears away towards the constellation of Leon. The three spiral galaxies form the heart of the M66 galaxy group, counting over 300 members. Astronomers do believe in a physical relation to the M96 group which is not very far off. 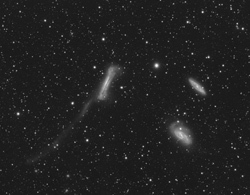 Probably the most interesting aspect of this image is the extended tidal tail, stretching up for about 300'000 lightyears from NGC3628's wraped edge-on disk. It is thought that this structure has evolved during a short but violent gravitational interaction with its neighbors. The tail is mainly composed of young star clusters and star forming regions. 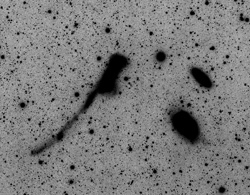 Two years ago, in 2008, I tried to image the tidal trail using an Canon EOS 20D on the same telescope but had to confess that it was too faint for this uncooled camera. However, under very dark skies with good transperancy I still believe that it is possible to image the tail. Click here for the Canon EOS image. Click on the preview images to find a larger version of a contrasted black & white and an inverted version to better see the tidal tail.